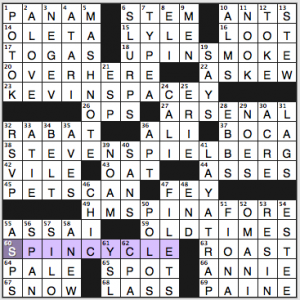 The theme is SPIN CYCLE, and the letters in “spin” cycle through in word order within longer phrases. Move the S to the end of PIN, you get the PINS in UP IN SMOKE. Slide that P to the end, now it’s INSP in KEVIN SPACEY. Slide the I, NSPI in STEVEN SPIELBERG. Slide the N back to the end for SPIN in H.M.S. PINAFORE. In each instance, the SPIN scramble bridges the gap(s) between words. 36a. [Who said “It’s hard to be humble when you’re as great as I am”], ALI. So damned quotable! 67a. [White icing on a gingerbread house, possibly], SNOW. If you build a gingerbread house and the walls crack and collapse, just add a Godzilla or dinosaur toy to the tableau and make it look intentional. 2d. [“It’s ___ Thing” (1981 hit by the Whispers)], A LOVE. Never heard of the song (here’s a video) before, despite being a Top 40 listener in ’81. To Wikipedia! Aha, it was a hit on the R&B chart, not the Billboard Hot 100. I dunno, I’m in favor of qualifying “hit” with the genre for a song that was only a hit on, say, the country chart. 9d. [Baritones, typically], MEN. Now, this guy, Chris Rob (brother of The Office actor Darryl Robinson), he is not a baritone. He performed some songs on public radio this morning—this one was particularly nice. Piano, some falsetto, soul stylings—good stuff. 29d. [Dissents], NOES. Yes, it’s in the dictionary. It’s still an ugly word. I feel like NOES and YESES appear in crosswords far out of proportion to how often we really use these plurals. Debbie Ellerin is back today. She gave us a pan-oramic puzzle back in the second week of the WSJ dailies. This time, we’re doing DOUBLE duty. According to 73A [Clone, or what can precede each half of the answers to the starred clues], we need to place the word DOUBLE before each half of a theme entry. Got it? 18A [*Paycheck padder] OVERTIME. Double over (bend at the waist), double time (quickly). 36A [*Rare find in New York City] PARKING SPACE. Double parking (driving no-no), double space (text formatting option). 43A [*DraftKings rosters] FANTASY TEAMS. “Double Fantasy” (Lennon/Ono collaborative album), double teams (two-on-one defensive posture). 64A [*After-school get-together] PLAYDATE. Double play (baseball), double date (foursome on the town). This type of theme is losing favor in other publications, but I think this works well—especially since the repeated word in question is DOUBLE. We’re using it twice in each theme entry, so there’s some poetry in that. The theme entries are solid, especially OVERTIME and PLAYDATE. FANTASY TEAMS is on the borderline. It googles only at 663k compared to “fantasy football”‘s 29M, but I’d say it’s just this side of okay. PARKING SPACE gave me trouble. Before I cottoned on to the theme, I had PARKING PLACE which made me want RELAXES for 28D [Lies down for a rest] and PIMP for 38D [Ninny](?!). 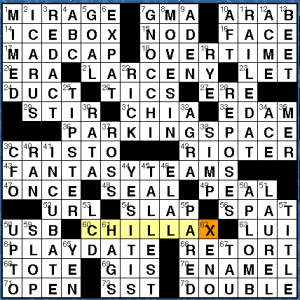 Then, RELAXES became RELOSES (which I suppose is a word, but didn’t fit the clue). Eventually PLACE became SPACE and all was put right, but not before some teeth-gnashing angst. Other goodies include TIPSTER, MADCAP, ICEBOX, ICARUS, INCUBATE, and LAUREL who pulled out APLOMB. There is the usual sub-par short stuff, but I didn’t feel it was too distracting. LUI (63A [Him, to Henri]) was the most uncommon of the crosswordese, and I wish SST would just go ahead and die already. A note about the clue for 69A GIS [PX shoppers]. PX is short for Post Exchange and is basically a small department store on an Army post. In the Air Force, a BX (Base Exchange) is its equivalent. Both PXs and BXs are run by the Army and Air Force Exchange Service (AAFES—put that in your word list). As of 2010, AAFES has rebranded both BXs and PXs as simply “The Exchange”. Ergo, PX and BX are both now obsolete terms. The Navy Exchange is branded NEX. I believe the Marine Corps and the Coast Guard have their own brands as well. Clues: I like [Revolting fellow?] for 42A RIOTER, [Root for the cook] for 13D BEET, and [Manhattan component] for 19D RYE (think cocktails). Bottom line: A good grid with a well-executed theme and nice non-theme fill. 4 stars from me. 62A [The next batch of flour being from the same common grain as the last?] WHEAT A SECOND (“wait a second!”) – This one is not the best…! 5A [“I Love a Rainy Night” country singer Eddie] RABBITT – We share a birthday, I believe! (Aug 7) I remember looking that up when I was younger. Other famous Aug 7 birthdays? Garrison Keillor, David Duchovny, and Charlize Theron! 16A [Team with the football] OFFENSE – Talk about another timely entry! Nationwide NFL marathon starts Thursday at noon! 32D [Pitcher Hershiser] OREL – Famous even YEARS after he has played. A true crossword puzzle immortal! 37D [Stealthy-sounding (but subpar) subprime mortgage offering] NINJA LOAN – I have never heard of this. But it is a thing! 53D [“A.I.” humanoid] MECHA – This also is a new one on me. Never saw the movie. Here is a link to the characters. There are a lot of “Mecha” characters in this. Netflix, maybe…? And there is a long weekend coming up to! I’m beat. More solving tomorrow. See you for the Holiday Buzzfeed puzzle! A rather nice puzzle this week. As I solved, I noticed that there were an awful lot of Xs in the grid (7 if my count is correct), and so I delved further, and this puzzle is indeed pangrammatic. I am sure this had to be a conscious choice by the constructors and not a coincidence, right? If I am confusing you, pangrammatic means it contains all 26 letters of the alphabet at least once. This is not as easy as it sounds, because there just aren’t many words that use J, Z, Q, and all the other high-value Scrabble tiles! Very clever. Actually took me a minute to understand what was going on, even though the solve time was low. Maybe because I was tired, but after the first third went slowly, the rest fell fairly easily. Fill is good in an unremarkable way; there is nothing even remotely problematic. Almost seems effortless! I wonder which of this constructing duo is the grid filler? Whichever, masterful job! 26A [___ Mahal] TAJ – The Amazing Race was just there last in Friday’s episode. I am so jealous of those racers! Definitely a bucket list goal to visit there! 11D [Republican-voting area, on an election map] RED STATE – Are you sick of politics yet? I am not a fan. Here in Indiana, until recently, Indiana was always the first state that was marked Republican on election night! 28D [Zooey’s “New Girl” role] JESS – I have seen this show, and I thought it was hilarious! The only reason I don’t watch it now is I don’t have time! It is definitely worth a Netflix binge watch! I told you I didn’t have much! 4.3 stars for an easy pangrammatic puzzle! What a celebratory treat of 11/26 this puzzle is. For starters: that larger-than-usual grid (16×15 today), with its serpentine pattern which yields triple 11s crossed by triple sevens in the NW and SE corners and nice, open corners NE and SW as well. Then: the presentation of the eight “side dish” themers, all framing the “sides” of the grid (whence today’s title)—with a holiday-related bonus at center. This is elegant puzzle making indeed. And (okay, with one odd exception…) the remainder of the fill only bolsters that impression. 1A. *CAULIFLOWER [___ ear (boxing injury)]. Ouch. 46D. *PEPPERS [Politico Claude, et al.]. 71A. *STRINGBEANS [Tall, thin folks]. 47A. *CELERY [Stalk around the kitchen]. Fave theme clue. I’m picturing one obsessed cook! In the NW, ANNIVERSARY, RAIN OR SHINE, ANAGRAM (with its literal-minded clue [Silent, to listen], since the letters in “silent” anagram to “listen”) and UNISONS (am not wild for this word in its plural form, but it is 100% legit). The longest SE fill may not sparkle quite as much (CENTRAL TIME and IRA ROLLOVER), but IDEA MEN (well-clued as [They’re so thoughtful?]) and POP DIVA more than make up for that. Especially enjoyed that last one because both the misdirectional [At times, it’s belted] for WAIST and [At times, it’s belted out] for ARIA had me thinking of belting as a vocal style and of [Lady Gaga, e.g]. Synchronicity! The kinda, high-brow music thang goin’ on with the likes of [Verdi opera] ERNANI, the ARIA [“Dalla SUA pace” (“Don Giovanni”)] (no belting for this one, please! ), Beethoven’s [“ODE to Joy”], [“The LARK Ascending” (Vaughan Williams work)]; and from the theatre world, the esteemed [Sir Laurence] OLIVIER. All of which is leavened nicely with the more pop-cultural KLUM [Heidi of “Project Runway”], [Hunky Brad] PITT, OREL [“Bulldog” Hershiser] and the downright low-brow [Drop TROU (moon)]. Balance is good! The [View from an oasis] DESERT pairing because it stirred up memories of Helene Wecker’s The Golem and the Jinni. Anyone else read it? A rich fantasy set in turn-of-the-(20th)-century New York and a fresh re-imagining what it is to be a stranger in a strange land. IVO [Nobelist Andric]. In 1961. For literature. But this gives me the opportunity to mention IVO van Hove, a superb and innovative Young Vic director currently represented on Broadway with that theatre company’s superb and innovative production of A View from the Bridge. RAM INTO, TALKS TO, UNKNOTS, CRESTED, IN A RUSH—good fill all! So the smallest of dings for that. But let me not miss the forest for the trees—because this is truly a beauty of puzzle, a beauty of a holiday puzzle and an all-around entertaining beauty of a solve. And in puzzleworld, that’s no small thing to GIVE THANKS for. Wishing you and yours a very happy holiday, and I’ll see you back here next week. In the meantime: keep solvin’—and fire up the speakers! 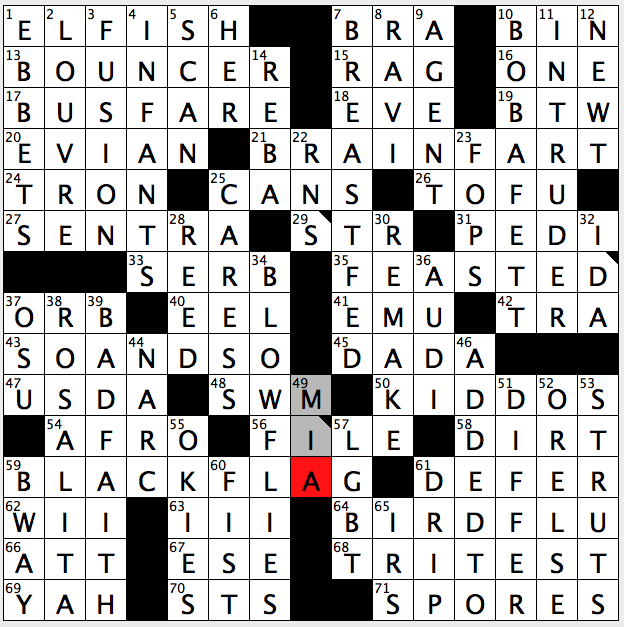 The quantity of theme material here outweighs the quality – 17A’s clue could use a trim (as could 64A), and the theme overall feels a little lightweight. If this had been released in one of the first few weeks of the BuzzFeed puzzle, it’d be one thing, but this feels just a little stale. 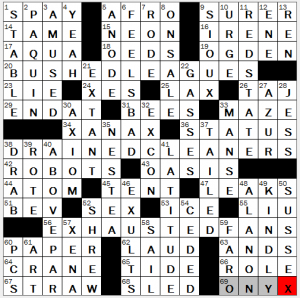 Similarly, it felt like there were more than a few references in the puzzle that may be a little outside the knowledge of BuzzFeed’s readership – The Banana Splits’ “The ___ La La Song” was something I had no idea of but got through crosswordese for 42A. Personal ads (as mentioned in 42A) felt similarly out-of-date, although in the same way mentioning that you had rented a video from Blockbuster. 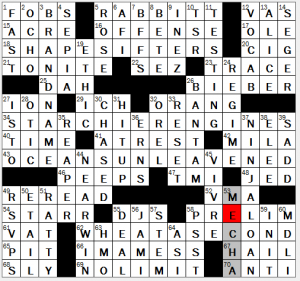 This Tuesday’s Buzzfeed crossword just felt a little like filler overall – maybe my standards are too high, but I expected a little more from the puzzle and the constructor (since I’ve solved Patrick’s puzzles before and really enjoyed them). Good morning, everyone! 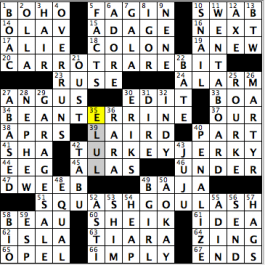 Today’s crossword, brought to us by Mr. Tony Orbach, features a little rhyme time with food, as each of the theme answers is a two-word entry in which both words, which happen to have the same-sounding syllable at the end of the word – are types of food. “Sports will make you smarter” moment of the day: BATE (22A: [Restrain]) – I know a number of people are interested in the UEFA Champions League, the tournament that crowns the best domestic soccer club in Europe, and the competitions continues today. One of the teams playing today is Belarusian side Football Club BATE Borisov, the champions of Belarus’s top division of soccer for 10 years running. The club was founded in 1973 and is located in the city of Barysaw, in Belarus. In case you’re wondering, the team colloquially known as BATE (pronounced Bah-tay) plays German club Bayer Leverkusen this afternoon. See you all at the top of the hump on Wednesday! This entry was posted in Daily Puzzles and tagged Bruce Venzke, Debbie Ellerin, Elizabeth C. Gorski, Gail Grabowski, Gary Cee, Matt Jones, Patrick Blindauer, Tony Orbach. Bookmark the permalink. Really wanted to get BUTTFUCK in there, but I couldn’t squeeze it in (ahem). I thought the BF puzzle was really good. The theme was simple, but enjoyable, and most importantly, the fill was terrific. It felt expertly crafted which hasn’t been the case with a lot of the other BF puzzles so far. 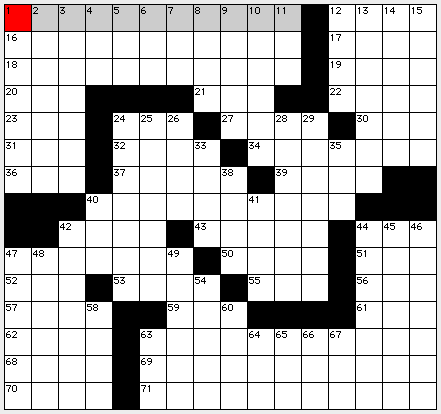 Turkey day – very fun puzzle to work. I, too, didn’t catch ‘realia’ and hadn’t come across it before. But it’s one of those words which tend to start showing up in other puzzles so I’ll be on the look-out. The clue for 9D:MEN is fine. The great majority (though not 100%) of baritones are men; there’s a significant fraction of men who are not baritones, but that’s not what the clue asked. 14A:OLETA crossing 1D:POTOK on a Tuesday, on the other hand, is indeed hard to justify. Fortunately I remembered 1D when solving Downs-only and stuck with it despite getting less than zero help from 14A. I never suggested the clue was off-kilter. Was just surprised that the brother of a somewhat burly actor had such a high voice, but loved what I heard and took the singing-voice clue as a prompt to post a link.